These Cherry Vanilla Coke Floats will make the sweetest dessert this Valentines day. Homemade cherry vanilla syrup, vanilla ice cream and coke combine to create a creamy, fizzy treat that will bring you back to childhood. I haven’t had a coke float in sooo long. They remind me of carefree summertime days and are so nostalgic. I love a simple coke float but add some cherry and vanilla and it puts it completely over the top. These little floats are a liiiitle fancier than usual but the extra effort is completely worth it. The extra effort involves making a homemade cherry vanilla syrup. Sure, we could use grenadine in these to make it easier but I’m letting you in on something. I can’t stand that stuff. It’s just so sweet and artificial tasting to me and I can’t do it. We could also use cherry coke but I just really liked the idea of a homemade simple syrup with real cherries. It only requires 4 ingredients, one of them being water, and 15 minutes of simmering. I went with frozen cherries because of the season and for ease (no pitting involved, whoohoo). To make the syrup, the cherries, sugar and water are brought to a simmer and mashed every once and awhile over 20 minutes. Once the syrup is strained, a little vanilla gets added to the syrup as well so there’s an extra dose of vanilla goodness along with the vanilla ice cream. Now listen up, I’m kind of weird about my vanilla ice cream of choice. Some may say all vanilla ice creams are equal. Buuut, using a natural vanilla bean ice cream in this situation just won’t be as delicious as classic, homestyle vanilla. It’s richer and creamier and more vanilla-y. Challenge me. I used these cute mason jars I found at my grocery store recently because I just couldn’t resist that cute little heart just in time for Valentines day. I can’t find them in stock anywhere online so keep an eye out in stores for them. I also have these milkshake glasses that I love for coke floats too. To assemble one of these coke floats, add syrup to the bottom of your glass. Then pour in your cute little can of coke and very gently add two scoops of vanilla ice cream. If you follow me on Instagram you saw what happens when you aren’t super careful about the ice cream addition, #hotmess. Whip these up for your loves this Valentines day for a fun, sweet treat. I don’t let my kids have caffeine (if you’ve met them you know why) so I’ll be whipping these up with some lemon lime soda for them. Either way, they are a fun, creamy, fizzy way to celebrate. 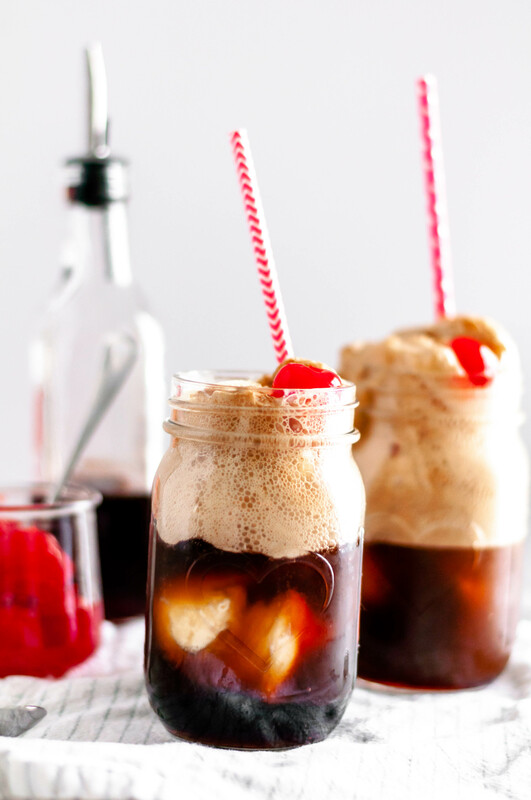 These Cherry Vanilla Coke Floats will make the sweetest dessert this Valentines day. Homemade cherry vanilla syrup, vanilla ice cream and coke. In a small saucepan, combine cherries, sugar and water. Bring to a simmer. Cook for 15 minutes, stirring and mashing every few minutes. Place a strainer over a clean bowl and strain syrup. Press cherries to get all the juice and flavor from them. Store syrup in refrigerator, preferably in a bottle for ease of pouring. To assemble the floats: add 1 1/2 tablespoons of syrup into the bottom of each glass. Pour a can of coke into each glass. Carefully add two scoops of vanilla ice cream to each glass. Stir gently with a straw and enjoy.